The latest version Rolling Sky APK 1.3.8.2 is coming to Android. Maybe one of you still remember a legendary game on mobile phones Nokia, namely Bounce. Yes, you move the ball left and right, up and down to finish each stage without making erupted because thorns. Even to this day I still remember code that must be used in order to be immune to any character. (7,8,7,8,9,8) Lol. One of the mobile game entitled Rolling Sky This reminds me of the game Bounce which is played a few years ago. You will drive a ball into a 3D dimension, and avoid any obstacles who tried to destroy you. When played, this puzzle game is also very similar to Temple Run, but has a more modest. 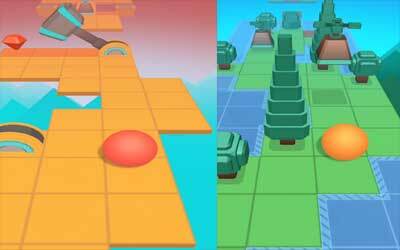 However, this game is quite difficult because you have to estimate the precise trajectory path so as not to hit the ball that is controlled obstacle. Maybe you’ll find this game looks easy. But in fact Rolling Sky is able to make you frustrated with map movement is fairly extreme and too fast. Sometimes you have to think one step ahead to anticipate changes in the folder that you can make the ball fall and lose. Drag left and right to avoid obstacles and stay on the track. Featuring a custom pumping soundtrack, colorful locations and impossible gameplay. New Lv14:Christmas. Time to dance with Santa Claus and the Gingerbread Man! Christmas promotion packages now on sale! Limited Christmas offer! In those levels that previously used the original soundtrack, now you may listen to each individual BGM before you start the game. Come enjoy the fascinating music! Optimized the unlocking of new levels when ads unavailable. Come beat more challenging levels! Fixed lags and other bugs. Very fun and addicting. The game is to easy. I already beat all the levels. There should be more. Also I like the idea of no check points. It makes the game more challenging and surprising.